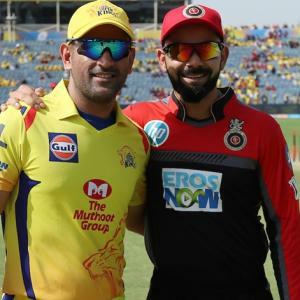 Rediff – IMAGE: Mahendra Singh Dhoni captain of Chennai Super Kings and Virat Kohli captain of Royal Challengers Bangalore. Mahendra Singh Dhoni praised his spinners Ravindra Jadeja and Harbhajan Singh for their stellar show while his opposite number Virat Kohli rued the dropped catches during Chennai Super Kings’ six-wicket win against Royal Challengers Bangalore in an Indian Premier League match, in Pune, on Saturday. “What we’re slightly worried about is the bowling department – if you see the first few games, there was no individual, who stepped up and said he could bowl in the death overs. Identifying our death bowler before the knockouts is the only thing we’re worried about and that’s why we’re making a few changes,” Dhoni said with reference to pacers David Willey and Shardul Thakur playing on Saturday. “We’re playing with multiple bowlers – two spinners and the rest pacers – that takes the pressure off the rest and allows Bravo to bowl at the death.